Adjustable Guyline Knot with Quick Release. Photo: Amanda Quaine. 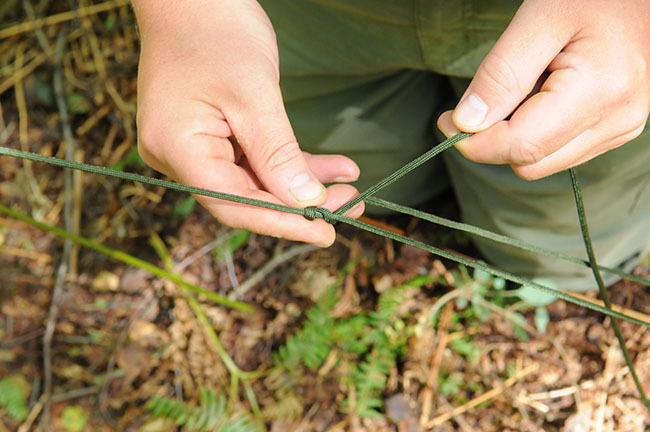 Sometimes called a slippery adjustable loop, an adjustable guy-line knot is very useful to know, particularly for those interested in bushcraft. Whether you are setting up a small or large tarp, or even a tent, this knot allows you to adjust the tension in a guy-line without the need for fancy clips or toggles. The absence of of tensioning clips or toggles also means you can pack your guy-lines away more tidily. A slick and easy knot to tie, once you have mastered it you will be able to pitch camp even more quickly. For the weight-conscious back-packer, using this knot instead of the tensioners fitted to tents and some tarps will allow you to shave a few more grams off your pack-weight. What follows applies equally to tent guy-lines as well as tarps but for simplicity I will just refer to tarps. Typically we use a peg to fix guy-lines but we can also use conveniently placed tree-stumps, exposed roots, saplings and trees. For simplicity I will just refer to pegs. Bring the guy-line down from your tarp, around the peg and return back up towards the tarp. 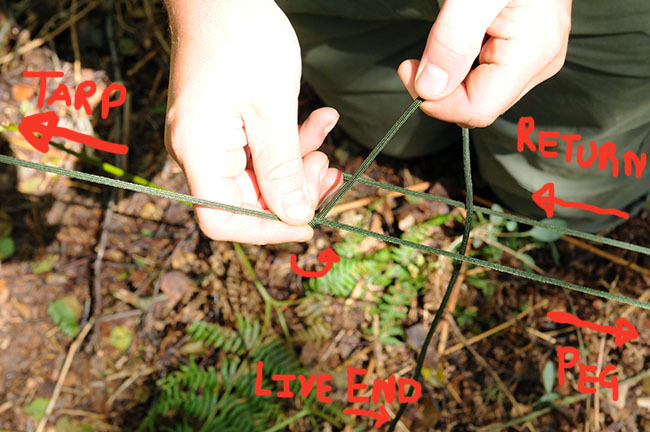 Take the live end around the standing part (the section of line between tarp and peg) then up through the middle of the loop created. Photo: Amanda Quaine. Make another turn - go around the standing part and up through the middle again, working back down towards the peg, so that what you have looks like this. Photo: Amanda Quaine. Make a third turn but this time, instead of coming up through the middle, go around both sections of line that run down to the peg. Photo: Amanda Quaine. Pull a bight through the loop you have created. (We pull a bight through rather than the whole live end so that the knot will be quick-release). Photo: Amanda Quaine. 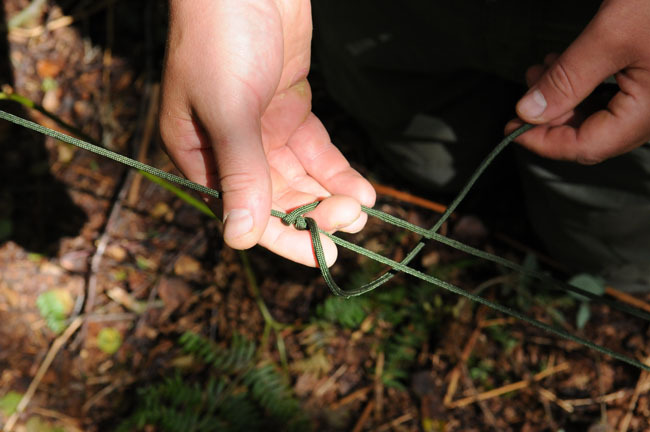 Pull the knot up tight and you have your completed adjustable guy-line knot with quick-release, which should look like this. Photo: Amanda Quaine. Slide the knot up or down the guyline to adjust tension. It will stay in position. Photo: Amanda Quaine. Keep things tidy. Hank the remaining live end of the guyline like this. Photo: Amanda Quaine. Stow the hanked guy-line between the two sections of line that run down from the knot to the peg. This helps prevent unnecessary tangles and trip-hazards, it also looks neat! Photo: Amanda Quaine. That’s all there is to tying this very useful knot. I like its elegance and the way it helps you simplify your equipment. It reduces clutter attached to your tarp/tent. It also speeds up pitching and breaking camp. 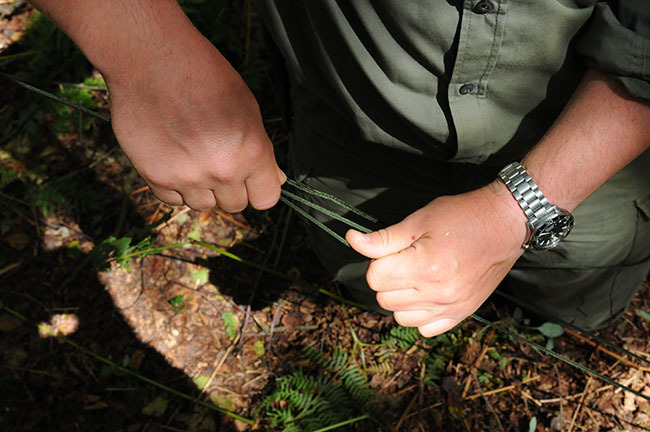 To release the knot, all you need to do is pull the live end, pulling the bight out of the knot. I hope you found this article useful. Let me know in the comments – too many pictures? not enough pictures? would more descriptive text help? Also, if you have found uses of this knot for things other than guylines, let us know in the comments. Finally, if you think this article would be useful to someone else, send it, share it or tweet it to your friends. Thanks! Hi Paul, I think type of post is really useful. The photos do a good job of showing how to. I know from personal experience how difficult it can be to teach knots to some people. I think the description you provide says all it needs to without making things too complicated. Good job! 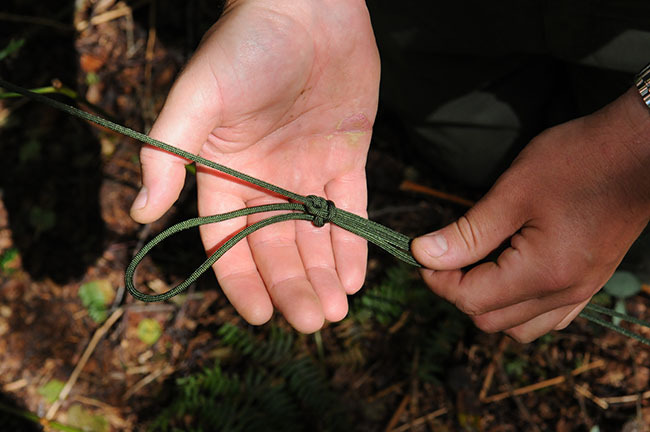 Although not a different use, I have used this knot quite a few times as a makeshift repair to scouts’ tents and others on expedition. I have also created washing lines with it. Good to hear you thought the article was useful. I can see how you would use this knot or similar (e.g. tautline hitch) for tensioning washing lines too. I have to again admit another one of my weaknesses…knots ! This particular one will really help me, I currently use my own ‘adapted ‘ version of a Prussik to ‘fix’ my parachute/tarp lines, this one looks far better. I think knots require a logical – mathematician’s brain, to conquer and retain them all successfully. Keep them coming it would be great to add to my modest collection. I have also used the knot as a type of halyard for raising and lower antennas for work as it is easily to adjust and stays in place till you move it. Under tension it works best and the more weight the stronger it stays. Good to hear from you again. Yep I agree, it’s the simple stuff that you use repeatedly that really sticks over time. Interesting to hear your other uses of this knot. Thanks. 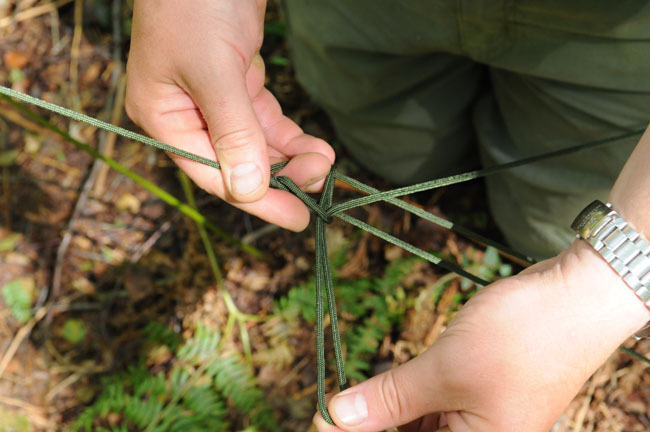 Hi Paul, good article as ever – a simple knot to tie and therefore to teach. (K)not sure what you plan as future ones to show, but may I be as bold as to suggest that for some knots, pictures using wider diameter cord/ropes might be useful? Sometimes its difficult to see what wraps round what when thin cords are used. Naturally you wouldn’t want to tie your hooch up with climbing rope, I just mean as a demo of the knot! Off at a tangent, I now use red ropes for all my tarps, especially with groups, to minimize people tripping over them. And finally are you aware of http://www.animatedknots.com ? No, this is finally(!) – clove hitch best “knot” in the world? Discuss…. I think that demonstrating with clear (colourful and larger diameter) ropes is definitely worthwhile but I also want to show these knots being shown in situ in the correct context. Maybe both ways in one article is the way forward. Theory and application? Good to see you over here. Which version do you use? I use the tentline hitch with first 3 wraps then just a tie off at the other side of the knot with a loop. Great step by step photo’s, ive wabted to learn this knot for some time. Ive seen it down my many Bushcraft experts, but they do it fast, hard to see what there doing. This and the evenk knot are the only ones I use. Is this basically a taut-line hitch? I saw this as a variation of my favorite knot, the taut-line hitch, right off the bat. I like the addition of the quick-release here, especially for if you have a long length of good line you don’t want to cut. Thanks for the great pictures, always essential. I’d add my vote for taking the photos with line that’s easier to see, rather than the aesthetic purity of thin, green line. I understand your point about showing it “in situ”, so maybe you could show the final knot that way, while the step-by-step photos use a bigger, even multi-colored line? Thanks for your comment. Yep, the quick release works well. 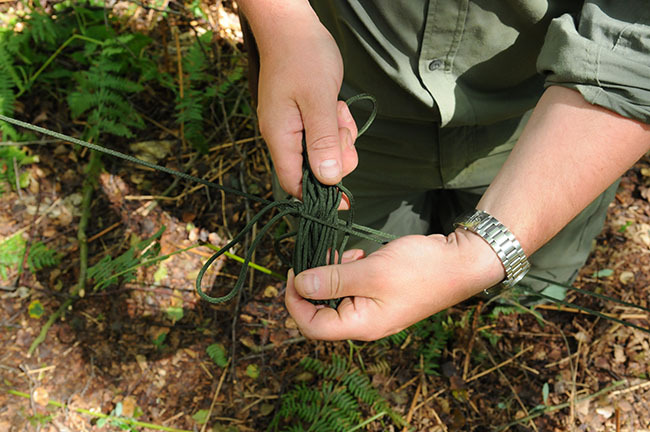 I use this method of creating a quick release – by passing a bight through – with quite a few ‘standard’ knots. Thanks also for your feedback on the pictures. I’ll include some pictures with larger, more colourful line in future. If I’m correct, this is a (slightly modified version of the) Taut-line hitch. A very useful knot indeed. One of my favourites. For people struggling with tying this knot, they might find this Wikipedia entry useful. By the way, in my experience you should really dress the knot well. Else it doesn’t have enough friction and may start slipping (depending on the rope). With all of these knots, tying them well definitely makes a difference, particularly with ‘slippery’ line. If in doubt, a good tip is that you can always make a further turn before finishing the knot so that there are three turns then the finishing turn around both lines. By the way, would this knot also work for tying a hammock to a tree, or isn’t it secure enough? It’s not secure enough for suspending a hammock. I will include some other useful knots for this. That’s one of the things I like about knots – there are lots of variations and subtleties within families of knots. It’s interesting watching how people learn. I used to also teach Ju Jitsu and my experience in this area has certainly helped my understanding of how to teach the physical skills of bushcraft. Different people learn in different ways. Your description of having to mimic Bob’s movements to reproduce the process of tying the knot is not so uncommon in learning to undertake a set of movements. Thanks Paul another interesting article, very clearly shown, I do know that knott and it is very usefull simple and effective, though I don’t usually use it as a quick release I must try that. Have you tried the Dolly or Truckers knott? maybe not particularly usefull out in the feild, but with a little modification to the way you tie it and secure it can be great for for really taught ridge lines, but it is exceptional for secureing kit to a roofrack or roofbars, you can get ropes as tight as ratchet straps and it is unbelievably easy to undo afterwards. Great stuff, I love knots! I guess that makes me another man who needs to get out more – or should that be get in more? 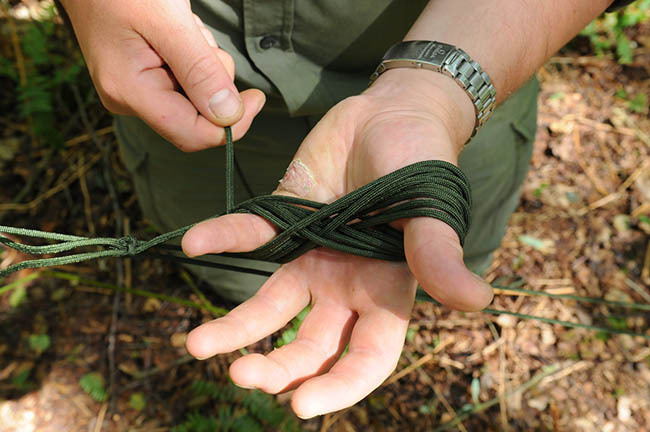 I think that there are really very few knots one needs to learn in order to manage most of the tasks encountered in ‘bushcraft’ and camping. Actually it was many years ago when I was looking for a book from which to learn an adjustable friction knot like this one that I first encountered Ray Mears in print. Coincidentally there has recently been a related thread over on the BushcraftUK forum called Tarpology Knots, see: http://www.bushcraftuk.com/forum/showthread.php?t=78600 (it’s a ‘sticky’ so this ought to be a permalink). There’s a further link in one of the posts there to the Wikipedia page for the ‘Farrimond friction hitch’ which can be used in the same way as this knot, but has the advantage of being ‘slippery’ so it falls away without a tangle when the working end is pulled. I tried the ‘Farrimond’ out at the weekend and it does seem pretty secure. More useful knots please Paul. Paul, Loving your blog, hopefully one day I will have a blog as good. Have you ever come across or used the Farrimond Hitch before, which works the same as the adjustable hitch. I just find that the Farrimond comes away cleaner when you pull on the release end of the hitch. I am familiar with the Farrimond hitch. I do believe its inventor wrote to Ray Mears with an explanation of it when I was Course Director at Woodlore. Just picked this knot up a week or two ago, great to see it explained here too! Good stuff. I hope it’s proving useful! I have not seen these knots used in reverse in any of the knot books. GREAT SITE, KEEP IT UP. Paul, good post and good pics. Have been meaning to try this one for a while and can see its use in securing guy lines. For securing a tarp ridgeline I’m a big fan of lightweight luggage straps. I tie the rope off on 1st tree then make a loop eight inches short of second tree. Run the strap through this and round the tree and you can easily tension/ loosen with one hand. They have a ton of uses including lashing up wood while you gather it, securing items to pack frame and securing rolled up tarps. Yes, I can see that would work quite well as long as the buckle held. Does the strap come undone easily enough? Also, did you see the videos on all of the tarp knots I use as part of the 20 free videos here on my blog? I think you might find some of that knot content useful too. I’ve been stuck on this knot for too long and saturday just gone I did it! Out of the many videos and guides I’ve seen, it was yours (long ago printed off) that cracked it. As typical, it was the day my bungees had arrived to avoid having to use this knot – ah well! This really is such a good blog man, the same day I worked out my hammock was anchored to a sycamore – my Collins pocket guide was too shady on a few bits, got on the smartphone and within the minute your tree guide got it bang on. That’s great feedback thank you. It’s good to know that I’ve helped you nail more than one thing by the info I’ve posted on this blog. Plain and simple, this is a great hitch. I have really been enjoying learning and using knots and particularly hitches in the last couple years now. Thank you for sharing. Thanks for your comment. I’m glad you agree this is a great hitch. This has to be one of the easiest knot tutorial s ive ever tried. Thanks for this, will remember this knot for a long time. Thanks for posting this. I was aware of this knot many years ago, but I just wanted to remind myself how to tie it. It is Christmas Day down here in New Zealand and I’m setting up a gazebo outdoors to provide some shade…. and because we often get wind in the summer, I am taking the precaution of anchoring it to the ground…. thus my desire to use this knot. Thanks and best wishes… Stephen Coote, Nelson, New Zealand. Happy Christmas. Thanks for this! I’m useless with knots. Nice, I might give this a try instead of the tautline hitch, which is what I’d normally tie for this purpose. Let me know how you get on with it as an alternative Chris.